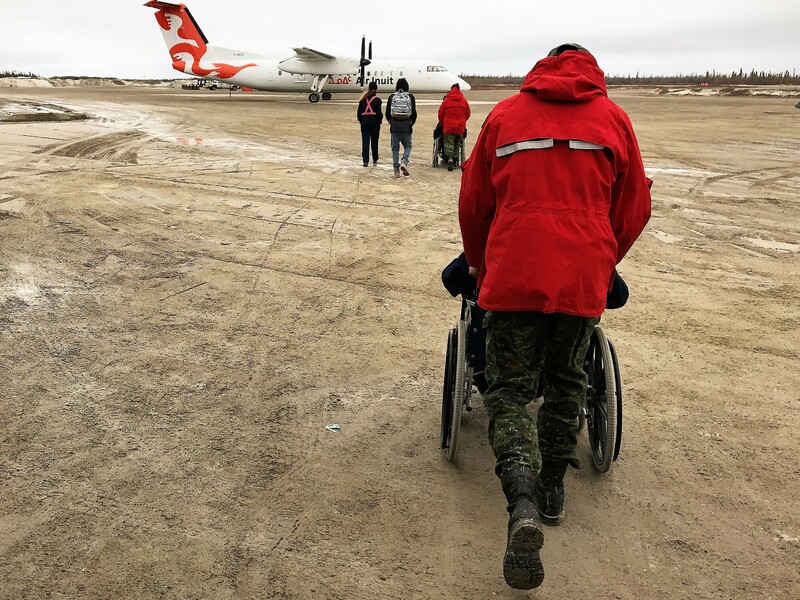 Canadian Rangers push elderly residents in wheelchairs to an evacuation plane in Kashechewan. Members of the local Canadian Ranger patrol are participating in the emergency evacuation of Kashechewan First Nation because of fears of flooding from the ice-jammed Albany River. The Rangers, who are part-time army reservists, spent much of Friday assisting vulnerable evacuees onto planes taking them south to Kapuskasing. The community declared an emergency and asked the province for assistance in evacuating its 1,700 inhabitants because of fears that ice jams could cause the river to rise and flood the community as it has the past. The army was asked for assistance and the Canadian Rangers were directed to provide help. The community on the James Bay coast frequently evacuates in the spring because of both real and threatened floods. Many families are currently on the land taking part in the traditional spring goose hunt. They are often brought back to Kashechewan by helicopter so that they can be flown south until the threat abates. Kaspuskasing is the first of several southern communities that will receive evacuees from the Cree community.